Your starting point is the Arc de Triomphe du Carrousel (not to be confused with the actual Arc de Triomphe), pictured at right. 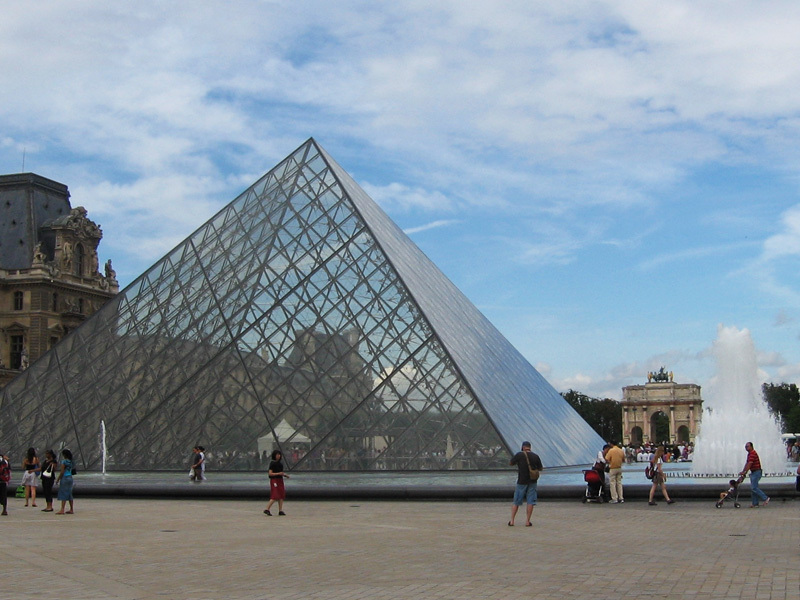 One of my favorite walks in Paris is a long straight line from the courtyard of the Louvre to the Arc de Triomphe. Put yourself in the Louvre courtyard and face the Arc de Triomphe du Carrousel. On a clear day you can see the following things all lined up perfectly in the distance: the arch shape of the Arc de Triomphe du Carrousel, the Egyptian obelisk at the Place de la Concorde (marking the place where the guillotine stood during the French Revolution! ), and the Arc de Triomphe in the distance! Between the obelisk and the Arc de Triomphe is the Champs-Élysées, which is just a street, so it's not visible from here, but that's where you'll be walking. Anyway, the whole walk goes like this: you'll start at the Arc de Triomphe du Carrousel, walk through the lovely park called the Jardin des Tuileries (named for the tuileries — tile-making shops — that used to be here, all the way back to the 13th century), go around or through the Place de la Concorde, continue on the Avenue des Champs-Élysées, and finally arrive at the Arc de Triomphe. The whole walk is about 2.2 km (1.37 miles). Here, I've made a Google map that plots out the whole thing. Interestingly, beyond the Arc de Triomphe, if you were to continue following that straight line, you'd arrive at the business district called La Défense, with its Grande Arche — basically a huge modern interpretation of the Arc de Triomphe. You may be able to see it when you're at the Arc de Triomphe; you can certainly see it if you pay to go up to the top of the Arc. You could theoretically walk all the way out to La Défense from here, but it's not nearly as pretty or interesting a walk as the rest of this, and there's not much to do once you're at La Défense. However, there is a giant thumb there. Seriously.